In 2295, deep in the Beta Quadrant, in star cluster NGC-2548, the crew of the U.S.S. Enterprise, NCC-1701-B, discovered the lost ship U.S.S. Hyperion, a Federation prototype missing for nearly twenty years. Captain Chekov dispatched his executive officer, Commander Uhura, with orders to get the derelict operational and returned to Earth. Once back at Earth, the Hyperion was readied for reassignment. On January 18th 2296, the U.S.S. Hyperion, NCC-10100, was launched with its new captain, a new crew, and a new five year mission. 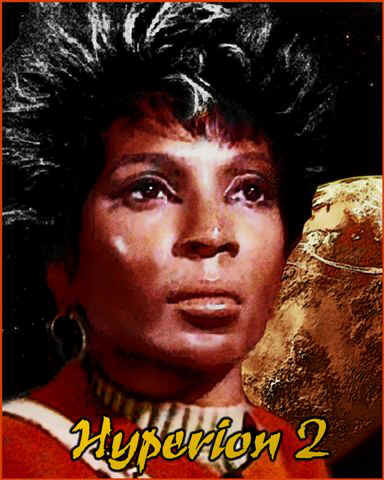 These are some of the stories of Captain Uhura, Science Officer Drevan, Doctor M'Benga, First Officer Ken Reichard, Chief Engineer Indri, Communications Officer T'Soral, Helmsman James Marsden, Physician's Assistant Harrison "Hardav" Davids, Doctor Giacomo Eletto, Weapons Officer Joe Tucker, Nurse Marie Webb and Assistant Chief Engineer Jesse Running Bear. The Hyperion is sent with a hold full of seed and plants to rescue a colony whose agriculture is being devastated by a local fungal blight; the only problem is that the colonists won't take charity from anyone. Cover Artwork by Joseph Melvin. 148 pages, 8½" x 11" size, coil binding. Price: $13.75, US Priority Mail. $19.75; International Priority Mail.